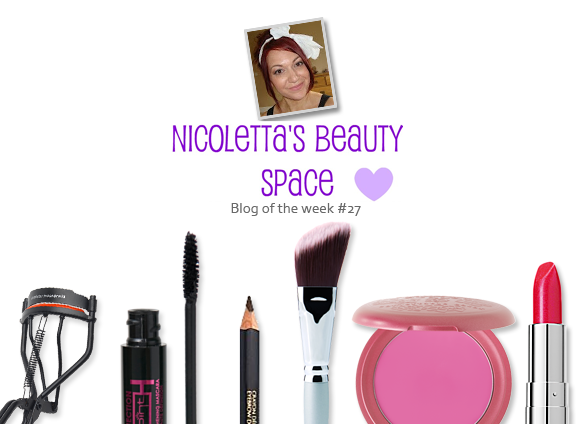 Blog of the Week this week goes out to the lovely Nicoletta of Nicoletta’s Beauty Space. If there was an award for the most glamorous mum in all the world, she’d definitely get my vote (gah, sorry mum)! Nicoletta’s blog is a lovely and warm place jam packed full of incredibly helpful reviews. One particularly fab post is New Crown Makeup Brushes! whereby Nicoletta dissects the pros and cons of a set of brushes that she has received. Not only does she systematically review each brush with both first impressions and the results after use, but she takes helpful pictures of the brush heads resting against her face. This is a small inclusion, but it’s only when you see how well they match up to their description (or not as the case may be) that you appreciate this small gesture. Aside from her informative posts, Nicoletta takes some damn lovely photos! Take a look at Ring a ding ding Collection and Strawberry Feels Forever Massage Bar – just gorgeous! Take a look at Nicoletta’s lovely blog right here, and follow her over on twitter. This entry was posted on Friday, July 8th, 2011 at 8:00 am and is filed under Blog of the Week. You can follow any responses to this entry through the RSS 2.0 feed. You can skip to the end and leave a response. Pinging is currently not allowed. Yes she takes lovely photos and I Subscribe to her blog too, well done Nicoletta.